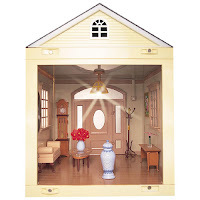 The plastic modular dollhouse by Jazwares called Room by Room Dollhouse has returned to the market. It is available via ToysRUs. This dollhouse always strikes me as what the Fisher-Price versions (Dream Dollhouse, Loving Family + extensions like Grand Mansion, Twin Time, Sweet Sounds, Home & Stable, etc. etc.) should have been looking more like in the early 90's. I find it bizarre that Mattel (Fisher-Price) has never truly redesigned that dollhouse. 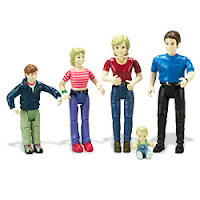 I like the late 70's/early 80's Fisher-Price dollhouses but since that design, every year it's the same old same old with a new coat of paint and a different name to give the impression that it's something new. I will congratulate them on moving slightly away from the pastel pink and blue palette. The chunky pieces work well for children but the design is still way way off. And there's too much plastic. I'm still waiting for a company to make a killer modern dollhouse out of bamboo. Imagine the floors! Anyway, that entire toy company (Mattel and it's subsidiaries) seems out of touch with consumers. Where was I...Oh! 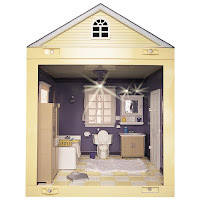 the Room by Room Dollhouse is a cool concept for a toy dollhouse but lacking because you cannot fully decorate the house/modules due to the built-in furniture structures that allow the unit to produce "realistic" sound effects, etc. When I learned that this dollhouse had been reissued, I had hoped that it was going to have a completely new exterior design, color palette and decor. So far, it looks like it is the same set of modular rooms as before. 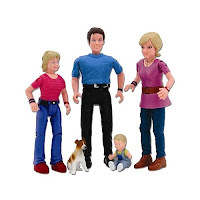 The only change that I do see is that they repainted some of the pitiful Room by Room dollhouse family figures (new version on right)...and apparently turned the little boy into a dog. It's not bad for a play house, though. And the rooms you're showing are pretty nice considering they were probably designed to take a lot of abuse. True, the Room by Room does seem to be decent for play. I guess I always want toy companies to take it a step further. Last time this was produced, they had a great module that was clear acrylic all around called the Sunroom. I purchased about 8 of those and made a "glass" townhouse---course, it didn't have any stairs so it was kind of incomplete, but I enjoyed decorating it. I'm sure I have images somewhere. I'll have to look. Years ago, I gave the structure away to a coworker for their daughter. It was a hit. Dude. You don't even get the accessories this time with the rooms. I keep readin' the Toysrus site and they are gonna be selling the furniture and accessories separately from the rooms. What a rip!